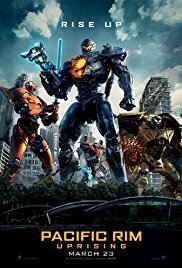 When the first Pacific Rim was getting made, I was stoked - finally some modern day giant robots beating down some giant monsters. It's everything I could have wanted, and when it came out and I watched it I was very content. My first thought upon hearing of a sequel was more of an underwhelming "eh?" than anything else - it isn't that I thought it was going to be terrible or anything of that sort, I just didn't really feel the first one needed a sequel. Well, now that the second one is out I've seen a few reviews on there largely acting like the first was some sort of masterpiece and proclaiming all manner of complaints towards the new one that didn't make sense to me having seen the first. Of course I planned on getting to it at some point, but tonight we form our own opinion and see what happens after the apocalypse has been cancelled. And there I was, experiencing the tried and true start to a sequel - an informational dump intermingled with "flashback" scenes of the first movie. I do suppose these moments are very handy for some people, but for me, I didn't really need most of it - I still remember what a Jaeger and a Kaiju are. For others though, I'm sure it's a necessary thing - and it also goes on to help inform us about the fact that we have a new character as a son to one of the first's heroes. After this, we get into the movie proper, which plays out a bit like you would expect a teen romp to - kids getting into trouble, and that trouble causing them to have to go down a path or get some time in the slammer. It somewhat sets your expectations for the movie - despite the similarities that I guarantee you will be coming up, this almost teen power trip sort of thing never really leaves the movie, and I'm sure some people might not like that. For me though, there isn't much more of a power fantasy that you could get than being some nobody who can make their own robot and because of it end up getting trained to pilot the real giant robots to do battle with evil should it ever return. Beyond that, the plot actually ends up working a bit of intrigue into it over the past one - instead of it being a simple good vs bad alien invasion story, here we hold our aliens back till the finale and instead make it this mystery battle against an Earth-side force yet unveiled to us (until the movie shows us who the force is). It makes for having the same elements of mystery as the first in a different manner, and that can keep it a bit fresher than just completely refreshing the first. It also seeks to answer the question of "what was the original bad's goal?" and gives pretty much the same answer any of us would expect that was pretty much also already known in the first - so really it's almost more of a gimmick to give the plot a reason to finish off in Japan. I'm not complaining, the first was whisper thin as well, so I'm not exactly expecting a sudden Shakespearean space opera to pop out of the sequel to a giant monster versus pilot robots movie. The pacing might feel a bit off, but at the same time it really doesn't. I think it might largely just be the slow start that gets you off balanced for the rest of the movie, because everything flows fine and very similar to the first - talky character scenes, threat happens, battle, rinse and repeat. Again, this is fine to me, and no worse off from the first movie. I'd even say that we have roughly the same amount of Jaeger units getting screen time here - a very large amount of Gypsy-main with a gaggle of three musketeers backing the sides. If anything, you could say it's a bit derivative at this point considering that the similarities to the old setup are a little on the nose - big bruiser, fast new stuff, gypsy, and one that uses three people. Again, this isn't something that bothered me, but it's worth pointing out for the people who expect every sequel to be Halloween 3. Of those giant robots, they all look good. Movement still feels pretty large, with an emphasis on a slower movement in most cases to give the robots a sense of weight. Some of the action scenes can be a bit hectic - particularly a foot-chase not involving robots at all in the start - but after that the camera seems to get to the point where if it is doing some shaking you aren't noticing it nearly as much. Some moments do seem like they cut a bit more than they have to - but if you had a dime for every time I've mentioned that sort of thing in a movie you could probably afford to pay me to do these things. Regardless, holographic elements look crisp, the robots all look good and move well, and there's some elements that come into play later on that feel far more detailed than they really needed to be - and that's all quite nice. Sound department was a bit mixed. Actor audio was on point, hardly ever having any issue standing above the noise, with the sound effects normally being pretty punchy and good as you'd expect from something with giant creatures. The music, on the other hand, has this strange habit of bringing in tunes from the first, only to sort of short-sell it and cut into something else. It feels less like bringing in character themes or prequel remembrance and more like an accidental button press at times. Otherwise, the soundtrack sounded very similar - granted one surprise song in there not so much because of the original Pacific Rim. Something I do enjoy a bit is that since we get to spend plenty of time with a British accent in this one (as opposed to the original which was largely just American accent main with the rest popping up across the board). On the flip side of that, however, I feel on a whole there is actually less accents (or foreign language leading to subtitles) than the first, what with things relegating largely to English or Mandarin. If this movie suffers from any one major thing, it's that it just isn't as new a concept anymore. The first properly stood out in a crowd, because we really just didn't get anything like that. Yeah, sure, Robot Jox or Godzilla vs MechaGodzilla exist - but for the specific feel of what the first had on offer there just wasn't any real live action substitute. Here, we have the other in existence already, and in turn nothing this one does stands out nearly as much in comparison - not that rocket boosters, Arctic ninja-slash, or Voltron Kaiju aren't cool, they just don't feel like they have the same awe as watching a giant robot pick up a shipping ship and smash a dragon in the head with it. The kid actors also aren't quite as impressive, given they don't have the same breadth of costume design as the old pilots did - but they don't do a terrible job acting, and Boyega still brings his charisma to the movie and the actors do a good job of meshing together on screen. If you swapped this background to some cherry blossoms it'd be like a ninja fight. If you loved the first Pacific Rim, you'll enjoy this one. If you didn't, I don't think there is anything here to change your mind. It deals some cards to try and change things up a bit, but largely it doesn't change things up all that much. I find I'll probably pick it up at some point because it's more of the same stuff that I like, but perhaps people on the fence would do well with giving it a rental just to make sure before hand.